The audio launch event of Puri Jagannadh’s son Aakash Puri’s debut film as hero, ‘Andhra Pori’, directed by Raj Madiraju, was held at Rock Heights – Shilparamam in Hyderabad. Producer of the film, Ramesh Prasad, Rajendra Prasad,Prakash Raj, Sekhar Kammula, BVS Ravi, Aakash Puri, Ulka Gupta, Chaitanya Krishna, Nandu etc. graced the event. Prakash Raj launched the theatrical trailer of the film. Sekhar Kammula launched the audio and gave the first copy to Prakash Raj. Ramesh Prasad said, “This is my second film with Raj Madiraju. I produced this film only for him. Because I think he is very sincere and hardworking. He selected all his team members. Aakash Puri and Ulka are very good actors. I wish them all the very best for their future .Everyone worked very hard and the team deserves a success”. 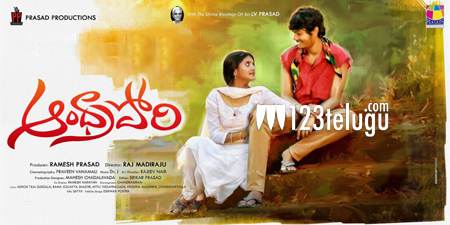 Rajendra Prasad said, “The title ‘Andhra Pori’ sounds very good. Ramesh Prasad is a very good friend of mine. I used to live in a house beside Prasad Productions in Chennai. We used to meet everyday. I wish success for our lovable director Puri Jagannadh’s son and the whole team”. Ramajogaiah said, “I wrote the title song of the film. I loved the tune very much and wrote it. I am very happy to have worked with a very good team. I wish them all the very best”. Suddala Ashok Teja said, “I know director Raj, since we worked together near Dasari Narayana Rao. He used to be an associate director. I am very happy that he became a good director now. I wrote the Detthadi song in Hyderabadi slang, which I consider is very beautiful”. Sekhar Kammula said, “Aakash is very fortunate to have acted in a film, produced by Prasad Productions. I hope he becomes a big hero. I wish success for the whole team”. Aakash Puri said, “I’ve been waiting for this moment for 16 years. I want to thank many people today. Ulka Gupta gave so much competition to me. She became my best friend. Everyone supported me and I thank all of them. When Raj sir narrated this story to me, I didn’t agree to act in the film as I wanted to be launched as hero after few years. But my father suggested me to watch ‘Time Pass’ and I liked the film very much. I thank Prakash Raj sir for coming here. It is only because of my father, I am here. He gave me a good platform. I love him very much and I only want him to introduce me as hero after three years. I love films and people who work in films. I don’t know anything other than films. I even discontinued my studies to act in films. So I want everyone to support me and make me a hero”. Ulka Gupta said, “I thank Raj sir for choosing me as heroine in this film. This film is based on a successful story and I am getting introduced by Prasad Productions. So I hope I will do many films in Telugu. I am very happy to have acted with a future super star like Aakash. I want the blessings of everyone”. Dr.Josyabhatla said, “When director approached me for this film, he said that the film is not in my genre, but he wants music in my genre. I didn’t understand what he said. I saw Marathi film ‘Time Pass’. It is a soft film, but director Raj changed it to a mass film as Telugu audiences love such films. I thank my music team, director, producer and everyone supported me”.